The poet behind a place called No Homeland talks about community, identity and how art can help. Kai Cheng Thom is a writer and performer, and has a masters degree in social work. 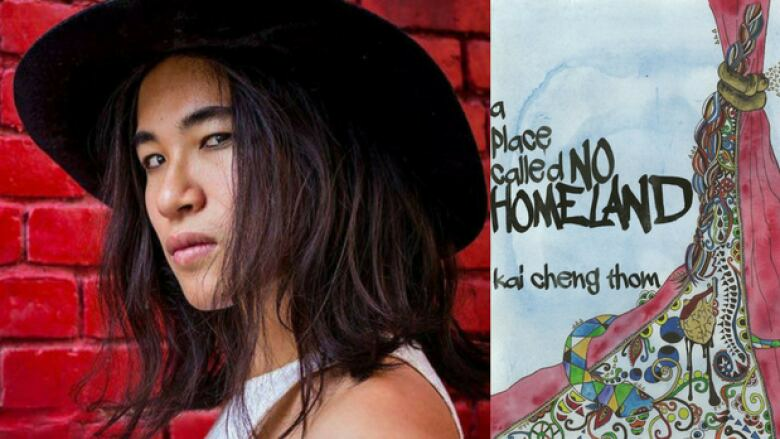 Her new collection of poems, a place called No Homeland, is an intimate journey through topics like gender, race and sexuality. Many of the poems emerge from her story of navigating identity as a Chinese Canadian transgender woman. In her own words, Thom talks about the creative process behind a place called No Homeland. The poems themselves came from my own need for survival. When I was growing up, there were a lot of things going on and I didn't see that reflected anywhere. I really needed a place in which to see myself and I wasn't finding any creative or artistic work that showed me that. So I had to make my own. As people of colour and trans folks so often do, if you don't see yourself, a vision of yourself, you have to create it on your own with the hope that it will make it easier for you to survive and also will generate community and connection. That's exactly what I was trying to do while I was writing most of those poems. A lot of them are written at like 2 a.m. or 4 a.m. after really difficult experiences. I'm a writer for spoken word, mostly. I write poetry, do slam competitions, that kind of thing. While I like to think that the oral tradition can still be seen in my work on the page, some of the pieces needed to be re-written so it would work as page poetry also. An example of that is the poem "girlboy, you femme femme fabulous." We ended up doubling its size into a palindrome. The lines in the poem all go in one direction, hit the climax in the middle, then the rest of the poem is actually the same lines, but in reverse. a place called No Homeland captures a sense of place and a non-belonging that resonates throughout the book. I'm a Chinese Canadian writer writing about cultural diaspora and there's a long established vision of that. But I'm also a trans woman writing in a gender-dominated, heterosexual-dominated world. There's this very powerful thread that resonates through both communities — queer and trans and Asian diasporic — around this longing for homeland. When I've spoken to other community members — friends, lovers, students — this comes up again and again and again. Where is my homeland? Where is the place that I belong? What I wanted to do with this collection was embrace the idea that we don't have to have a homeland. There is a place that forms between people, a place that is made up of relationships rather than geography. A place specifically created out of a longing for homeland — that is the place where we belong. So a place called No Homeland is intended to evoke the bittersweetness of that. It's the knowledge that one won't ever really belong, but that non-belonging creates the ability to develop new relationships and new connectedness. Kai Cheng Thom's comments have been edited and condensed.